I have to say, I dislike applesauce a lot. I think it’s a texture thing. Growing up, my sister was the one in our family who ate a lot of applesauce, I mean that she’d put it on her hamburger, on spaghetti noodles or eat it out of the jar. She loved it. I never did. 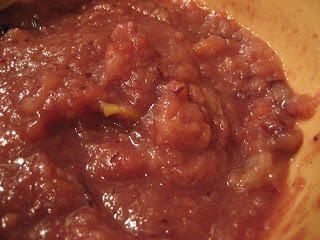 I thought I might like homemade applesauce since I would be able to control the texture. 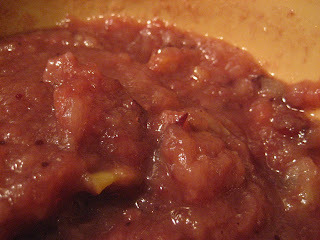 I had some leftover cran-applesauce from the potato pancakes I made, I decided to try my hand at homemade applesauce. I figured I was almost there, I just needed more apples and to thicken it up a bit. I took the leftover sauce and added 1 more cooked apple and mashed with my pastry cutter and voila! Like I said, I don’t like applesauce, but this stuff was amazing. Very very good. Can’t wait to make a whole batch! Put everything into a saucepan and heat until boiling. Once boiling, reduce heat and cover. Allow to simmer for about 30 minutes, or until apples are tender. Mash apples until reaches desired consistency (I left mine fairly chunky). YUM this looks SOOOO good! I love overnight breakfasts for holidays especially. This looks yummy. I love stuff like this for brunches! This looks incredible. oh I am salivating at the sight of your pictures. They look SO good! Sounds good to me! Loving this idea and hoping to make bread today, which in turn could be breakfast tomorrow.